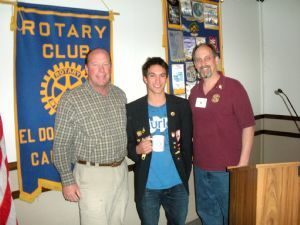 Elias Steyrer shares some of his Austrian culture and American-made memories at the March 2 Rotary Club meeting. Elias Steyrer wasn't that impressed with Disneyland. "It's pretty exhausting to go there," said the young man from Salzburg, Austria, who's attending Folsom High School courtesy of the Rotary Youth Exchange program. But the teen with a passion for his home country, wiener schnitzel and now American living has made many memories that will last a lifetime since he stepped on American soil a few months ago. Wednesday morning Elias shared his history and adventures with the Rotary Club of El Dorado Hills, one of his Youth Exchange sponsors. The Folsom Club also sponsored Elias. When he got the news that he would come to California Elias said, "I told myself before I came here I just wanted to play foootball" — the American version, that is. As luck would have it Elias, a halfback, played for the Folsom Bulldogs, who took their game all the way to the Division II State Championship and won it. "It was really amazing that I was on this team," Elias said while downplaying his role in the victory. "It was a pretty amazing experience and I'll probably never forget it." For his efforts on the field, Elias even received a letter congratulating him from fellow Austrian and former California Gov. Arnold Schwarzenegger. Elias said he'll also never forget the bike ride over the Golden Gate — San Francisco's famous bridge that the teen called "something special." So what's up next for the exchange student? Swimming. Elias has joined the Folsom High swim team and has his first meet coming up. It's another American adventure that has Elias excited, event hough he said he knows soon he'll have to return home — a more difficult task than he said he expected. "I don't want to leave my American family," Elias said. He's staying with Dan and Terri Haverty in Folsom. "I really enjoy spending time with them."